Have you had bad experiences with plein air umbrellas that were flimsy, funky, poorly designed, or just plain hazardous when it gets windy? Often when my plein air group is out painting, a gust blows over an easel or two when the umbrellas attached to them turn into sails. When I felt my old umbrella about to carry off my easel I started attaching it to the tall handles of my rolling cart (which also got pulled over once) but I had a hard time adjusting my small umbrella to be in the right place, at the right height or at the right angle. Now I have a ShadeBuddy Umbrella and Stand and the problem is solved. 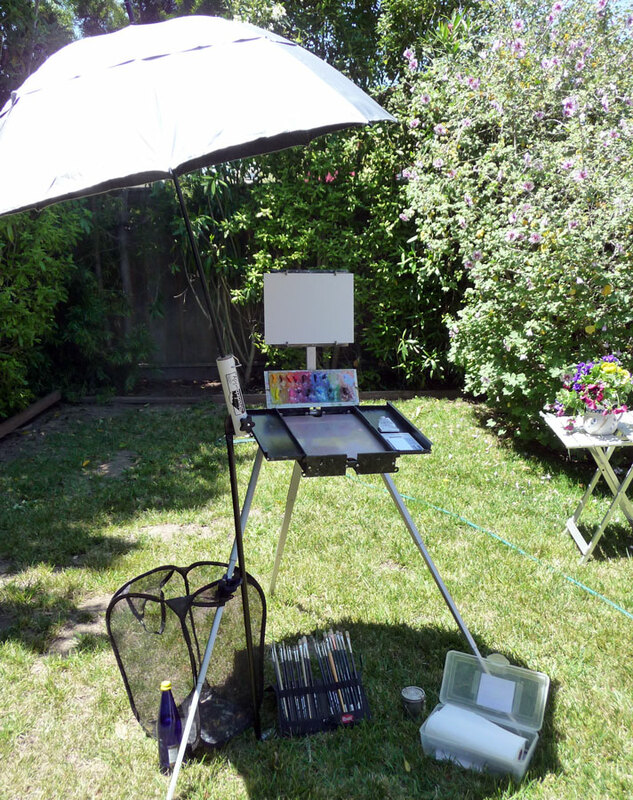 In the picture above the umbrella is set up in my backyard next to my Soltek easel. (Also pictured, is my trash container (a mesh pop-up laundry basket that folds flat to a circle about 8″ in diameter) clipped to my easel, a folding brush holder, and a plastic shoe box that holds my paint palette and paints. You can see the large area of shade the umbrella provides. The pansies and pitcher on a table I was preparing to paint are on the far right. The umbrella and the stand are two separate sections that fit together into the sturdy black zippered bag with a shoulder that comes with them. At the top of the stand is a white cylinder (above) into which you stick the umbrella’s wooden handle. 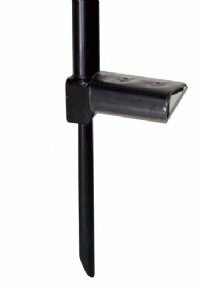 There is a secure locking mechanism for keeping the umbrella in the cylinder and a knob that allows you adjust the angle of the umbrella and then holds it in firmly at that angle. The cylinder is attached to a metal pole that has a pedal about six inches from the bottom that you step on to push the pointed end of the pole into the ground. When I set mine up for the first time I was surprised how well it all worked and how easy it was. I tend to be spatial-relations challenged and am always prepared for difficulty when assembling things but this was a snap. I was able to adjust the tilt and direction of the umbrella as the sun moved, and the vented umbrella handled the afternoon wind gusts with without even a flutter! The umbrella is very well made, with a 48″ diameter with “wind vented construction combined with a nonreflective black lining to keep your colors true and a reflective silver outer shell to keep you cool.” Both the closed umbrella and the pole are 48″ long and, when stashed together in the bag, weigh a little over 4 pounds. The umbrella and pole are manufactured and sold by Judsons Art Outfitters and are also sold at several major online art supply stores. I checked prices and availability on the web and bought mine on sale from Dakota Art Pastels. It was my first purchase from Dakota (in Washington state) and they provided excellent service. My new umbrella arrived two days after I ordered it. Having the easel made my previously posted painting, “Pansies in Pitcher Plein Air” a pleasure to paint, even under the hot sun in my windy backyard. Because I really appreciate good tools and well-made products that just work (and that experience is so rare! ), and because I know that many other plein air painters struggle with lousy umbrellas that flop or fly, I wanted to share my positive experience. I have no other connections with the manufacturer or store (except that I think highly of both). Judson Art Outfitters also manufacturers the Guerilla Painter line of plein air products and is a family-run business with very helpful and knowledgable staff who can answer most plein air outfitting questions with expertise. I’ve been using Shade Buddy for years, and actually not that happy with it. I now using a lightweight umbrella that attaches to my easel. The problem with Shade Buddy is the ground I paint on varies quite a bit. Often times, the ground is simply to hard to get the stake down far enough to hold. It’s a disaster at the beach. I just won’t stay up, especially with the slightest wind. I prefer the Artwork Essentials umbrella. In addition to Artwork Essentials, I also sometimes take a full, picnic table umbrella with a water-filled large base stand. This is a heavy duty solution (your car needs to be nearby! ), but the shade area is huge and it survives the wind really well! Thanks Ed, You raise some important points. It’s true that the Shade Buddy wouldn’t work in some areas, like on the beach or on a sidewalk. I guess there’s no perfect solution. My lightweight smaller umbrellastill travels with me for those situations where the ShadeBuddy won’t work, but often I just skip the umbrella and try to position my easel so the sun isn’t on the painting surface and palette and let my hat be my shade. I looked up your Artwork Essentials umbrella and it looks like an elegant solution that works on both the EasyL pochade box type of easel and the Soltek. Have you had any trouble with it trying to pull over your easel? From the photos on the Artwork Essentials websiteit looks like it’s only big enough to shade the easel (hence your lugging the big ol’ patio umbrella!). I know that you, like me, have suffered with back problems in the past. I imagine hauling the patio umbrella stand isn’t easy on the back. You are truly a dedicated plein artist! I so admire your constant striving to improve and learn and mainly to PAINT! Thanks for contributing your wisdom and knowledge to this discussion. I have the easyl umbrella set up and found it to be the best after three other attempts at other makes. This umbrella attaches firmly to my tripod, and with the elastic band stretched down keeps the umbrella in place. No problem with this one tipping over as I always hang my gear bag from the hook on the tripod to weigh down the set up. No problems at even the windiest day..although I must say on those days I paint with one hand ont he umbrella and one hand with the brush! 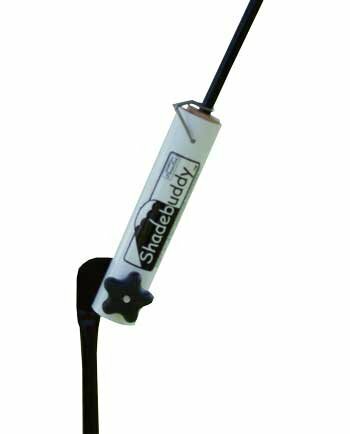 I’ve used the Shadebuddy several times, and it works well. One time the ground was covered with mulch, but it still held firmly. Once a gust of wind blew it inside-out, but it was easy to turn it right-side out again. And it’s big enough to shade not just your palette & easel, but you as well, which is a big plus when it’s hot out. You’re right, there’s no perfect solution. I like the diversity of approaches that are made possible by all the wonderful art suppliers out there, including Judson’s. I haven’t had trouble connecting my umbrella to my various plein air setups, but I don’t use Soltek anymore as it broke too often (at least annually). The heavy setup isn’t good on the back, but I can handle it–particularly if I’m painting in the desert, when an extra-large area of shade is priceless! Thanks for your wonderful blog! I enjoy it. Maybe a solution would be to sew loops onto the umbrella’s outer edges, and tie nylon cords to them and then fasten them to camping pegs, in the ground. Pretty much like you would a gazebo or tent? This would give you a pretty stable shade in most light winds. what do you think? Nobody seems to mention the problem that I had with the spokes of the umbrella breaking. They should be metal. Every time I open the umbrella, a new spoke breaks; eventually there will be no canopy curve. A great idea which needs to be made workable.